We have been having a lot of fun experiencing the intense flavor of Berkshire pork. We returned to the Hanson Family Farms market booth and procured some Berkshire pork ribs. The ribs were St. Louis style cut and frozen. This was a small rack and only weighed in at just under two pounds. I am not sure if this was a small pig or if this is typical of the breed. The cost was 10 dollars a pound and set us back almost a Jefferson. 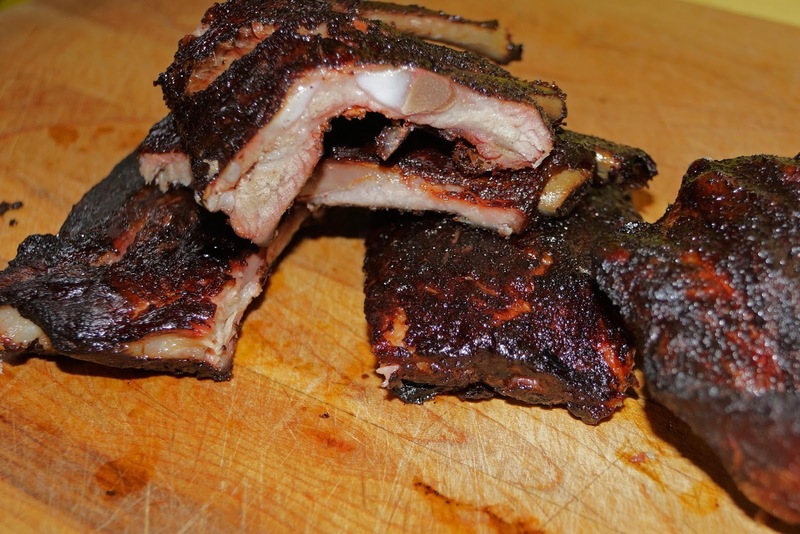 These special ribs would be cooked in our trusty smoker. Let's build a fire. We used apple wood chunks as our wood flavoring smoke today. The ribs were seasoned with our rub of the day. I did not trim a lot of fat leaving more fat than usual. I was concerned of the small size of this rack. It was thin. The ribs stayed in the smoker for two hours. They looked and smelled fantastic. These ribs would not be sauced. We wanted to experience the true Berkshire flavor with no distractions. We brought them inside for a very long 20 minute rest period. The flavor of Berkshire pork is something that really needs to be experienced. This was no exception. The tenderness today was not a high scorer. It did fall of the bone but had a little chew to the bite. I believe this was because of the size and the technique of our cook. This rack was devoured and enjoyed. 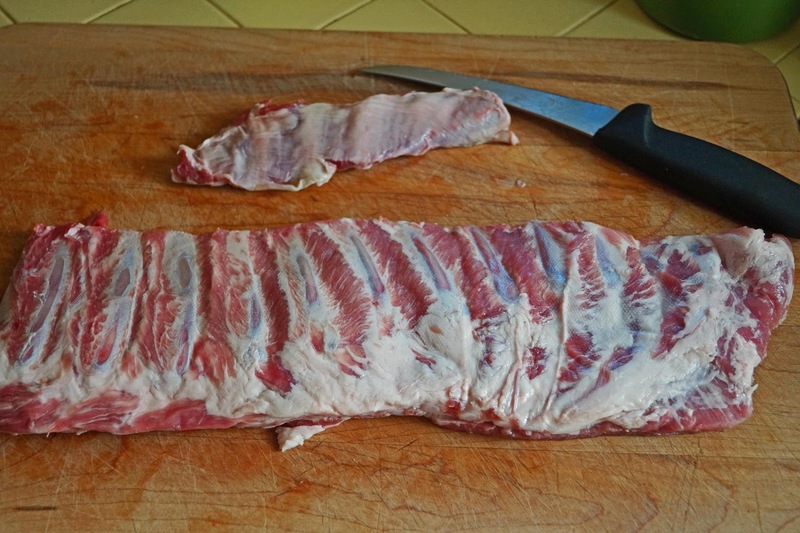 Would I buy Berkshire pork ribs again and would they do well in competition? To have a chance in competition these ribs would have to be bigger with more meat. They would have to be of consistent size to insure proper cooking technique to achieve ultimate tenderness. I personally will not buy these ribs again. We did love the flavor but at 10 dollars a pound a wonderful Berkshire chop would be preferred. Good work Paul. In the first photo, were those shiners I saw? On a second note, I've been taught that wide flat bones only occur with older pigs. I saw a few bones with this shape so it maybe an older pig that is small. And because of the drought, ranchers have been culling older animals but I'm not sure if this is the case for this particular ranch. I gotta try me some of these. Donna Fong, Shiners they are. When purchased they are frozen and availability is extremely limited. The owners send their animals to another party to be butchered. Information about the pig was not volunteered and I appreciate your information. I can almost guarantee you will like the flavor of Berkshire. 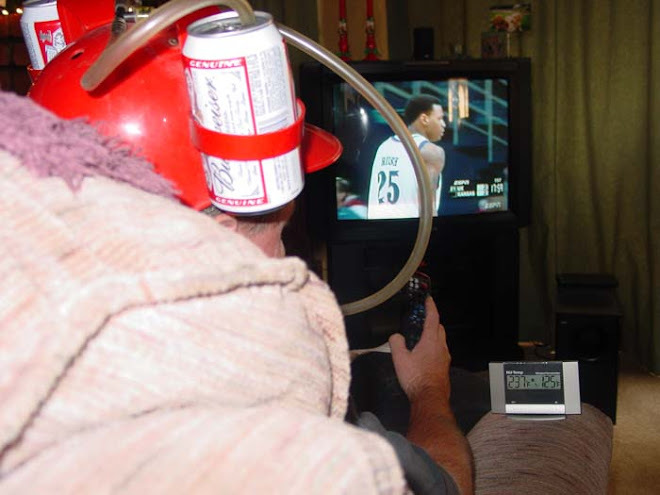 Have Fun. For those of you who do not know Donna Fong, she is the accomplished celebrity Pittmaster of the competitive team of "Butchers Daughter". A friend, mentor, and inspiration is Donna. Shiners= These are ribs were the bone is exposed along the length of the bone of the rib. This is caused by the butcher cutting to close to the bone. This is not desirable. If I get the chance, I'll get a rack of these to run a taste test against my usual. I doubt my unsophisticated taster will be able to tell enough difference to justify the higher cost - but I won't know til I try. First off, I'm glad you enjoyed the taste as that is what we are all about! As to the age of the pig, he was about five months old, so that is why the size was a bit smaller - can't tell you why the flat rib shape. I know in goats there are breed variations - maybe the heritage Berkshires have maintained some of an older style (just guessing here). I appreciate the information about the 'shiners'. As you know, in order to sell to the public, we have to have everything harvested and processed at a USDA facility. We go to a small one in Santa Rosa...I will ask them about the cutting. They are pretty good about taking constructive criticism. Thanks for sending me the link to the blog. It's very interesting and we never stop learning! Big Dude, I am pretty sure you will like the flavor of Berkshire. I would suggest you start out with a chop. That way you will get to experience the flavor with out cooking technique and variables that could influence the flavor. Eileen Hanson, Thankyou for your reply and helpful information. I hope you are not at the stoplight typing your reply as you mentioned last Saturday. My next purchase from you will be the bacon. See you Saturday. Thank you very much! It is rare to link a specific pig to what we eat on our dinner table. 5 months doesn't seem too young or old. So now I'm not sure if Berkshire genetics tend to have that bone shape or if you compared the bones of an even younger or older pig of the same breed, would it look different? I guess we will never know. Thank you again! I have to find someone around here who offers the heritage breeds. Those ribs look good and I'll trust your assessment of the flavor as you are the Mad Meat Genius. 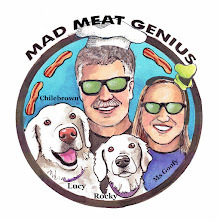 We are going on a Meat Adventure next weekend to a new local butcher. Hopefully he can come through for us. Three Dogs BBQ, Good luck on your Meat Adventure. It is too bad the Great White Hunter is not going with you because he is good for comic relief. I look forward to your findings. I have to admit that my first thought about this post was "Donna Fong reads his blog?". Glad you tipped off people to who she is. We tried Berkshire ribs once and our experience wasn't a lot different than yours. That's a small sample but I just couldn't bring myself to pay a premium for them a second time. We've been getting Cheshire pork ribs from Heritage Farms and have been very happy with the butchering, flavor, and how it cooks up. After 4 test cooks, we've decided to use them for our rib program this year.